The maniacal clown, PENNYWISE from the hit movie, IT, gets a brand-new treatment from the hands of amazing artist, Richie Mitchell. 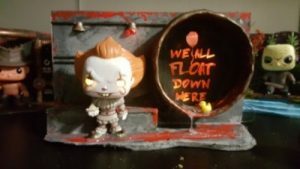 Pennywise is presented in his underground home next to a sewer pipe where words inside the pipe read “WE ALL FLOAT DOWN HERE”. The artist has also added a way to put batteries in the scene, to make the lights of Pennywise’s eyes and the words in the sewer pipe light up! It’s an amazing effect and one that will blow away fans of the movie. The Pennywise scene is limited to 5 numbered pieces at $350 per piece. 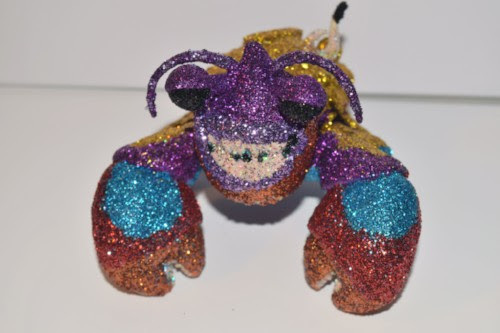 Artist Ben Flater has created 5 glitter-encrusted crustacean creations! 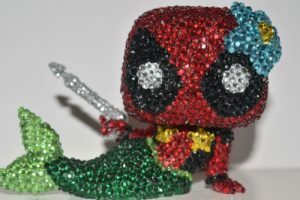 Pop figures of Tamatoa from the hit Disney movie, MOANA, have been hand-foiled in shiny glitter to complement the character’s song in the movie. His entire body is covered in colorful glitter, giving him an amazing shine in any light. Even HE would be impressed with the shiny veneer! The Tamatoa figure is limited to 5 numbered pieces at $200 per piece. War Machine’s DIAMOND TRIBUTE to the one and only Carrie Fisher debuts at SDCC as well. A crystal-encrusted version will be made available of her Princess Leia character from STAR WARS EPISODE 4: A NEW HOPE. 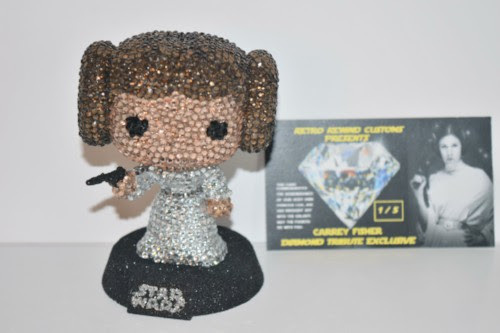 This beautiful figure took over 12 hours to create by hand with over 2,400 crystals adorning every part of her from her signature hair buns to her skin to her white dress. This truly highlights the artist’s and company’s love of Star Wars. This piece is limited to 5 numbered pieces with commemorative card inserts at $200 per piece. Ben Flater’s amazing Merc With A Mouth, DEADPOOL, is like nothing that has ever been seen! Deadpool has had many iterations of his character over the years from samurais to cooks to even a version of friendly artist, Bob Ross. This mash-up is of him laying down as a mermaid. We wanted to make sure that our makeover included multicolored crystals to highlight his…*ahem* added attributes. He is covered with over 2,400 crystals by hand taking over 7 hours per figure. This piece is limited to 3 numbered pieces. 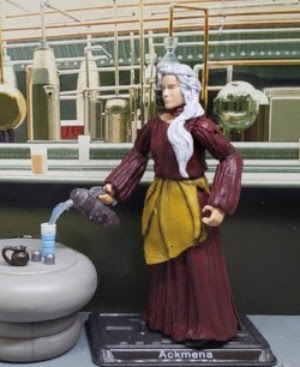 War Machine Marketing has also designed a figure of the late Bea Arthur’s bartender character, ACKMENA. This was designed, as War Machine Marketing is the official sponsor for the sold-out 501st Legion Party during San Diego Comic Con 2018. 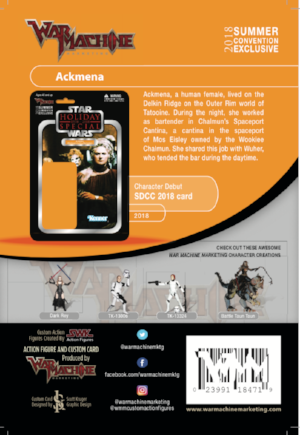 The Ackmena figure will have 8 points of articulation as well as a blaster pistol, a pitcher and cup. 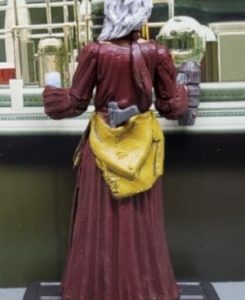 This is a one of a kind action figure and the lucky winner of this item will have the ONLY carded version of this figure in the world!